Mar 18, 2018. 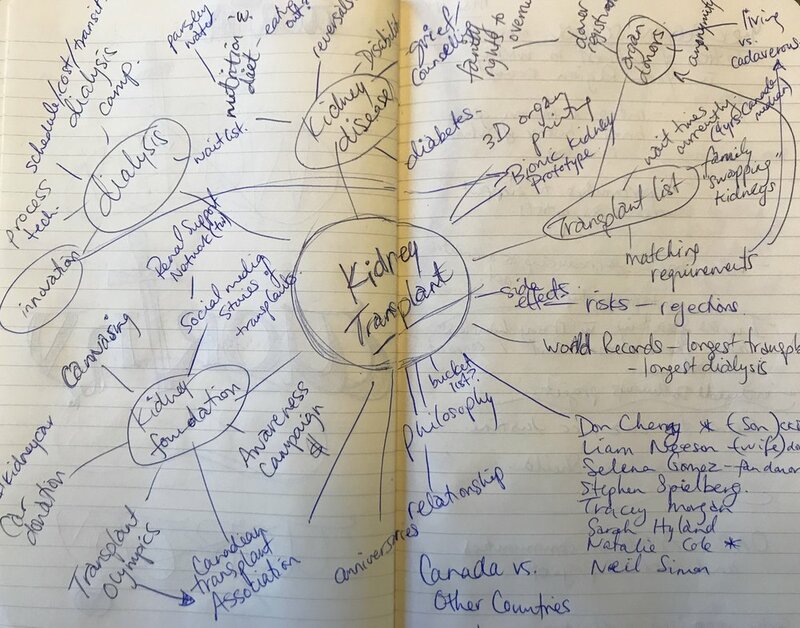 Initial thoughts on some of the things needing to be researched regarding kidney transplants - Arthurian research has its own brainstorming page. Decision 1: Do I edit interviews into shorter clips that suit social media preferences (time consuming editing process, more marketable = more viewers?) vs. leave them as is (immediately shareable, fuller picture of the interviewee’s experience)? I think I am going to leave them mostly unedited - first and foremost, these interviews are to help me with playwriting and the little details that don’t make the “soundbite” edit can be some of the most intriguing. When I was adapting A Christmas Carol, I used an annotated version of the book and there were all sorts of little explanations that didn’t make it into the published story that I found really enchanting and quite illuminating to my understanding of the story. Short footnotes became major sources of inspiration in my approach so it’s useful to our process to leave room for all the little bits, even if most people won’t watch longer than 2-3 minutes. However, there will be content later on that will be more of a structured segment and those will hopefully have the benefit of professional videography and editings. Huzzah! First decision made. Interesting, right?! While researching worthiness, I am questioning the worth and validity of my own process based on what I assume other people might like or expect. (I must tell you that I feel a little smug that I accidently just stumbled on that one - I know the theme of worthiness and how we qualify it is common in daily life, but so convenient that it just popped into my post before I had even really caught it or had to force it). That kind of thinking, though inevitable, will only slow us down so better nip that in the bud! I hope you enjoy reading and watching as we go and I encourage you to interact with the content and with us, but I am not going to worry about its worth to others quite yet. Side note: I just realized there is only one letter difference between Worthy and Worry - do you think that means something? Inquiring minds want to know. Back on track: In Summation, read what you want, watch as much as you want and hopefully by the end I will have pulled it all together into a logical, sequential script that makes sense to all brains, but until that point, logic and sequence is not the point.